20ga x 1/4" 16ga x 1/2" 16ga x 9/16" 16ga x 5/8" 14ga x 1/4" 14ga x 0.28" 14ga x 5/16" 14ga x 0.35" 14ga x 3/8" 14ga x 7/16" 14ga x 1/2" 14ga x 9/16" 14ga x 5/8" 14ga x 3/4" 14ga x 13/16" 16ga x 7/16" 16ga x 3/8" 20ga x 5/16" 20ga x 0.35" 20ga x 3/8" 18ga x 1/4" 18ga x 0.28" 18ga x 5/16" 18ga x 0.35" 18ga x 3/8" 18ga x 7/16" 18ga x 1/2" 16ga x 1/4" 16ga x 0.28" 16ga x 5/16" 16ga x 0.35" 14ga x 7/8"
Get a classic look with our steel ball closure ring with a hematite ball. This BCR has a hematite clip-in ball and makes a stylish alternative to regular steel BCRs. The hematite has a lovely metallic dark grey colour that makes the BCR stand out a little more. Hematite is a natural gemstone rich in iron. It is associated with strength and was carved into protection amulets by cultures such as the Ancient Greeks. I bought this to upsize my left lobe from 1.2 mm (16g) to 1.6mm (14g). The BCR went in smoothly, with minimal pain. The ball was, however, a bit tricky to clip in, since I had to use a mirror to see what I was doing. I ordered the largest size available (1.6mm x 22mm), and in this size the ball was 8mm, not 5mm. 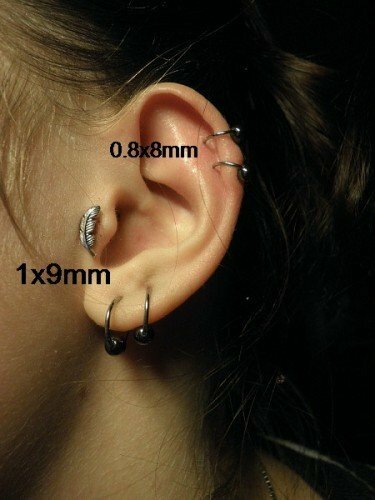 But the BCR looks really nice in my lobe piercing, and I'm going to order one more soon. Recommended! Looks amazing feels amazing. used this for a fresh helix orbital. works perfectly fine. would recommend. i ordered this product about a month ago for my helix and its so comfortable to sleep in and the hematite ball goes well with my newly done lobe which is the same colour. would deffo buy it again and recommend to a friend.